Descriptions of the services we offer are shown below along with estimated prices. Actual costs are determined once the frames are inspected. We will contact you for authorization prior to conducting any repairs. Please contact us for any specific issues that are not listed. Soldering Metal Frames - Please call for Pricing - Wear and tear make solder joints go weak and break. Soldering can be done easily and we use the highest quality alloy solder when repairing your frame. In addition, we buff all repairs so that discoloration is reduced. 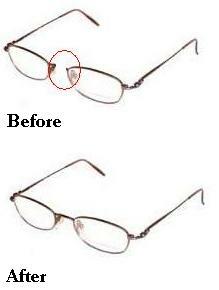 You should know that most repaired metal frames show some sign of the repair. However, we touch up color frames to help blend the original color with the repair. For frames with plastic trim near the solder point, a heat shield is used to protect and reduce the risk of burn on the plastic. 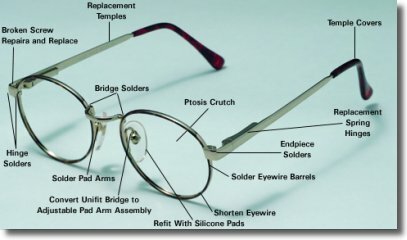 We also repair complete rimless and drill mount frames that require new bridges or replacement temples. We can salvage your favorite and expensive frames. Hinges $25.00 - Hinge broken? - No problem - easy to fix and our expert’s even joke about how our business survives on hinge fixing - so simply mail them in and we'll fix them for you. Nose Pads - Please call for Pricing- Nose pads are the cushion of your glasses which provide comfort for the bridge of your nose - they are flexible. 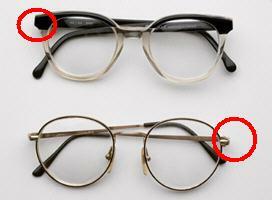 Almost 70% of heavily used glasses have to have their nose pads replaced. Don't wear your favorite glasses without nose pads. EarPiece/Temples/Bridge replacements $24.00 - $70.00 - We have a very large selection of temples from a variety of styles and sizes and are confident we can replace your broken temples. DON'T throw away your broken glasses, simply mail them to us and for a fraction of the cost, we can fix almost anything. Screw Drill Outs - Please call for Pricing - Some of the new designer frames put a lot of stress and load on tiny screws that are holding the frame together and the lenses in place. Over time, these can be worn out and come loose or sometimes break while leaving a portion in the screw well. This can render the frame un-usable until the metal fragments are removed. This can easily and economically be removed and we re-thread to salvage a favourite frame. 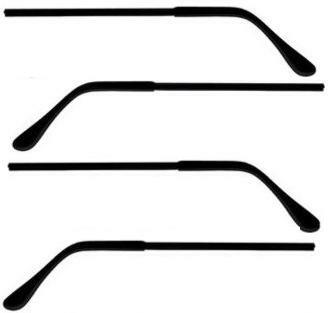 Temples to Cables $24.00/Temple - Many times, patients require a sturdier and more tighter fitting frame then what a traditional frame will allow. However, they are not willing to compromise on the style and or the conspicuous look of sports glasses. Using the same frame and temples, round cables are inserted to fit behind the ears and thus resulting in a firm fit that does not easily come off. Anti-glare Coating - Please call for Pricing - Anti Glare coatings can enhance the performance and appearance of eyeglass lenses. However,since the coating is placed on the surface of the lens, it has a tendency to get scratched easily resulting in distorted and or blurry vision. Using a chemical process, coating is stripped while leaving the lenses intact and the original optical qualities are restored. Designer Sunglasses replacement parts available - call us for an estimate! - We all adore our favorite pair of Fendi, Gucci and Versace and Marchon/Autoflex frames, designer eyewear, and it breaks our heart to see them broken. At Collin Creek Eye Clinic, we carry popular brands like above and have seen them become as good as new once we repaired.